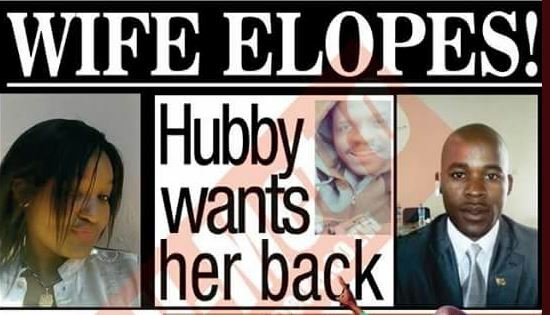 An Air-Force of Zimbabwe employee has tried but in vain to locate his wife of four months after she left their matrimonial home for her former lover in December 2014. Stanley Mapondera, 28, is legally married to Cyindalee Hazvinei Chapanga, 22, and the two tied the knot on August 7, 2014 and he has been left clutching a certified copy of their marriage certificate. In his narrative, MAPONDERA SAID ON November 28 in 2014 he left his home in Chitungwiza for a week’s work assignment in Chegutu. When he returned home on December 9 he discovered his wife was not home and during his absence she was staying with her former lover, Tonderai Chakaengesu. “The following day when I left for work, I found out my wife had left the house, destroyed our wedding photos and the original marriage certificate. I suspected that she was seeing Chakaengesu and I have now established that they are staying together. I just do not know where I am only left with a certified copy of the marriage certificate. When I married her, I knew she had a baby girl with Chakaengesu and now I have heard they have a second child, a boy. During our stay, we never had a child. Ndiye akandimanikidza kuchata kudaiso asi akundiita so,” narrated Mapondera. The distraught man said he engaged his wife’s family and he had talks with his mother-in-law whom he occasionally drank beer with. “I used to drink beer with my mother-in-law and when Cyindalee left, the mother-in-law tried her best to knock sense into her head but she could not come back,” added Mapondera. Mapondera said he has confronted Chakaengesu more than three times at his work place number F23 Gulf Complex, where he is a cellphone dealer, telling him to let his wife come home. He said he still loves his wife even if she has two kids. “I do not know where they stay. I went to Chakaengesu’s work place and reminded him I have a legally binding marriage with Cyindalee and he told me I should look for Cyindalee and tell her in person. Telling you the truth my brother, my marriage is still valid and I love my wife and what Chakaengesu is doing is wrong. Zvavari kita kuchaya mapoto uku. I love my wife and I still want us to continue with our marriage. I am willing to fulfil my vows and she should do the same. I have respect for my marriage certificate and have no intentions to dissolve the union, and that is why I am not looking for another wife. If I had no respect for my marriage, I could have married another woman or have many children. I went into depression to an extent that my wedding ring does not fit in the finger. Her having a second child means she has no respect for what we promised each other on our wedding day. I want us to work things out with no prejudice directed at anyone whatsoever,” he explained. Asked what he will do if Cyindalee refuses to come back, Mapondera said that will be her own baby. I do not want to revenge, but I am in pain,” added Mapondera. Efforts to get contact from Cyindalee were fruitless, but H-Metro spoke to Chakaengesu who confirmed that he is stating with her. “Yes, we have two kids together that I can confirm. I know that Mapondera and Hazvie are legally married but there is information which Mapondera did not tell you and you have to make an appointment so that we discuss the issue together,” said Chakaengesu. Chakaengesu however, refused to disclose where he resides, reiterating the appointment has to be in town. “I cannot dispute what he told you but I want my version to be heard when all parties involved are around. Kwandinogara hakuna basa, tinosangana mutown. We can meet anytime from Monday,” added Chakaengesu.